AgNet Media is a home-grown agriculture media company with Florida roots dating back to farmer investors who provided seed capital in the mid-1980s for the state’s first independent, commercial farm broadcast effort. Support for the farm news network came from farming, ranching and dairying families who joined together in a vision to create a farm media business that understood the very unique production region we’ve come to know as the “deep Southeast.” That phrase was coined by AgNet Media’s principal founder, Gary Cooper, who grew up on a small, family-owned winter vegetable farm in southeast Florida. Cooper graduated from the University of Florida with a degree in broadcasting in 1978 and spent a few years working for a statewide farm organization before dedicating his career to the network’s development. He remains AgNet Media’s president as another generation of young agriculture communicators join the team to move the operation forward. VSCNews.com (Vegetable and Specialty Crop News) is the latest addition to the AgNet Media family, complementing the company’s emphasis on news and information to target the nation’s largest and most critical diversified agriculture production regions. These high-value crops continue to expand in the deep Southeast as farmers in the region work to further diversify. In addition to the Southeast AgNet Radio Network covering Florida, Georgia and Alabama, AgNet Media also includes an established farm-radio network in California, where AgNet West went on the air in 2012. These four states produce more than 70 percent of the nation’s high-value fresh vegetables and specialty crops. 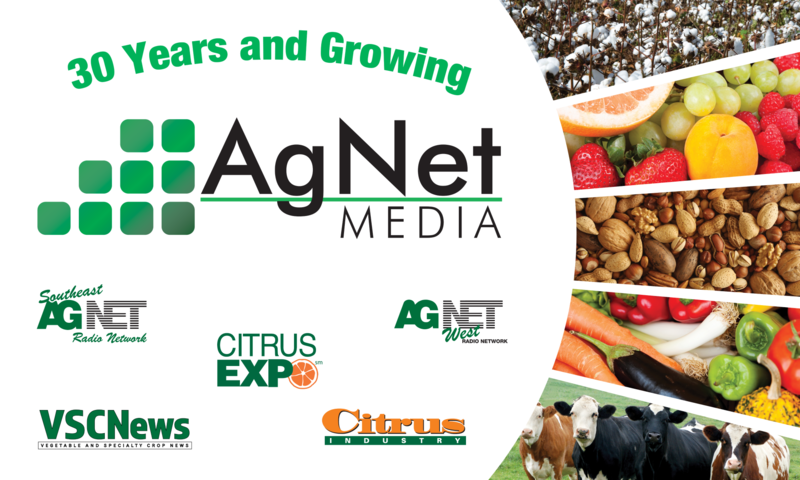 AgNet Media became the second owner of the 97-year-old Citrus Industry magazine in 2005, and its Citrus Expo event will celebrate its 26th anniversary in August 2017. AgNet Media, Inc. is the leading provider of agricultural news and information.